Like most people, I have a smidgen of self-control when it comes to pizza. The same goes for donuts. When they join forces, though, I am powerless. 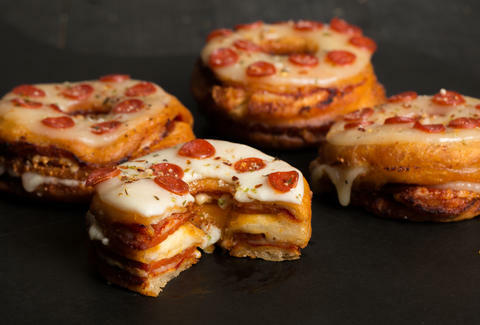 Like, if I were stranded in the middle of the ocean and a pizza donut was my life preserver, I'd die... because I'd eat it all... and drown... because I can't swim. But you know what I'd be thinking in my demise? "Worth it." Heat oil to 350℉ in a deep fryer or heavy pot fitted with an oil thermometer. Unroll crescent doughs into two large rectangles, making sure not to tear the perforations. Give the rectangles a couple rounds with a rolling pin to close up the perforations. Spread tomato paste evenly on one rectangle. Place mozzarella in an even layer over the tomato paste. Place pepperoni in an even layer over the mozzarella. Top it all off with the other rectangle; flatten it slightly with the rolling pin. Place 4 slices of provolone on half of the rectangle, and fold the other half over it. Flatten again with a rolling pin. Using a 3-inch round cookie cutter, cut four circles out of the dough. Use a smaller cookie cutter to cut holes out of the centers. Pinch the edges together every inch or so to make sure the layers stay intact. 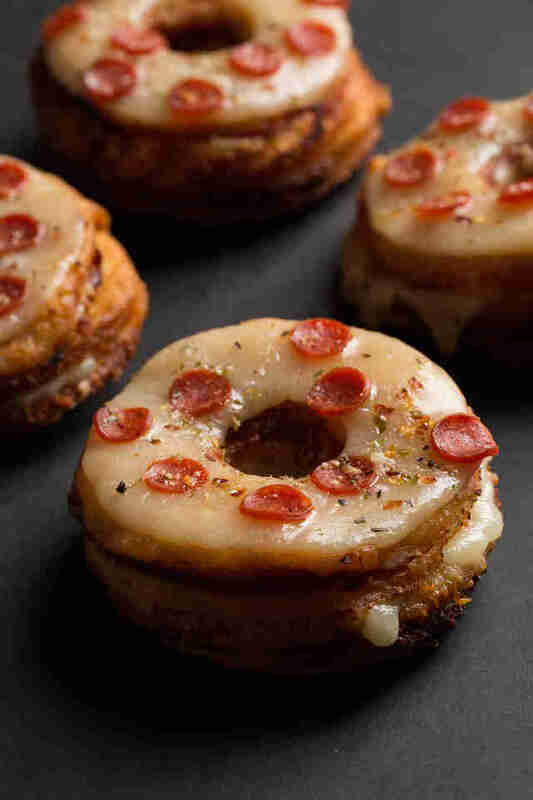 Use the same cookie cutters to cut four slices of provolone into donut shapes, set aside. Carefully drop donuts into the hot oil and fry for 3-4 minutes per side, until golden brown. Drain on a wire rack. 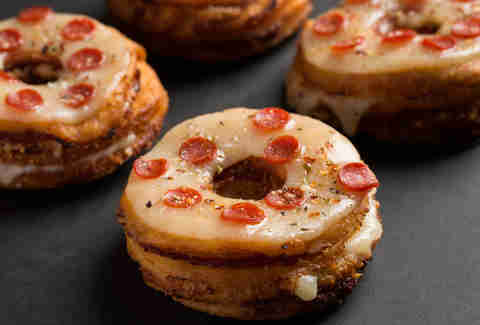 While donuts are still hot, place cut provolone slices on top. Finish them off with mini pepperoni. Perry Santanachote is Thrillist's recipes editor emeritus, and is but a servant to the food gods. Follow her at @perrysant.